May 1, early morning. It's a public holiday and I watch two streams of people go by. One is full of smartly-dressed people, many with children, making for Izhevsk's town centre. These people, factory workers, clerks and young people are all off to take part in the May 1 holiday procession. The second group is much bigger - these are all people going out to their allotments. They are dressed in old clothes and they carry buckets, baskets and bags filled with various tools. They will start planting the seedlings a little later, when the weather warms up. It's sunny in Izhevsk now, but still cool. The central heating is still on and it's cold in the street. In the morning the temperature still drops to minus 1-2 degrees. I'll come back to the gardeners and marchers, but first it's time to take a look at the neighbouring yards, where I walk my dog. Izhevsk seems to have had a particularly hard time emerging from the winter this year. Public spring-cleaning campaigns began around the time of Orthodox Easter and are still not finished. The housing and municipal workers, joined by rare volunteers from among the local residents, sweep, scrub, gather all the rubbish into big bags that are then put out in the streets for collection. On the May 1 holiday huge mountains of these multi-coloured plastic bags filled with last year's rubbish lined all the main streets. Who knew when they would be collected? They could well end up staying piled up there until the middle of summer. Curiously, about the only thing left in the areas cleared of rubbish were thawing cats' corpses, and for some reason rather a lot of them. I can't help feeling a painful tug inside every time I see one. But the yards and streets are starting to look more presentable - modest but clean. Modest because the yards are paved for the most part with completely cracked and potholed old asphalt that hasn't been replaced for nearly half a century now. Along with this are battered old railings and equally battered children's play areas. It's a fashion here to use old outer tyres to plant flowers in, make barriers alongside the footpaths, or erect whole pyramids of tyres all painted different colours. They can also be turned into odd kinds of ‘sports equipment' at school stadiums and sports areas in parks. My collie, Greg, chooses his own route. He knows the whole area through and through. I recognise a good number of fellow dog owners. Izhevsk, with its population of 600,000, doesn't have a single special dog-walking area, so we walk our dogs along the streets, in the parks, across the grass. Street cleaners, yard caretakers and cleanliness fanatics hate us for this. It's probably understandable. It's interesting to recall that the first law passed by the first democratic City Duma in 1994, was the Rules on Keeping Pets, which among other things, set a tax on owners of cats and dogs to pay for walking areas and an increase in caretakers' wages. But the rules were never actually enforced and no one even mentions them these days. Long-time dog owners told me that 15 or so years ago it was far more popular to own dogs than now. Far fewer people these days keep dogs, and those who do tend to prefer fighting breeds such as pit-bulls and the like. It's rare to see dogs from among the big breeds. This doesn't surprise me. I end up spending at least 500 roubles a week on food for my animals - a dog and a cat. Besides the dog owners, you also see the homeless out and about every morning, sometimes alone, but more often in whole ‘teams', collecting empty bottles and beer cans. This is their way of collecting revenue from the citywide beer-guzzling that goes on. It's not uncommon to see college girls drinking beer in the middle of a weekday. A few days ago, I even saw two young mothers sitting drinking beer, while their kids played nearby in the sandpit. Over the last 3-4 years, people have been drinking more beer, and the amount of empty beer cans and bottles has increased. You used to see 1.5-litre plastic bottles, but now it's common to see 2.5, 3 or even 5-litre bottles. 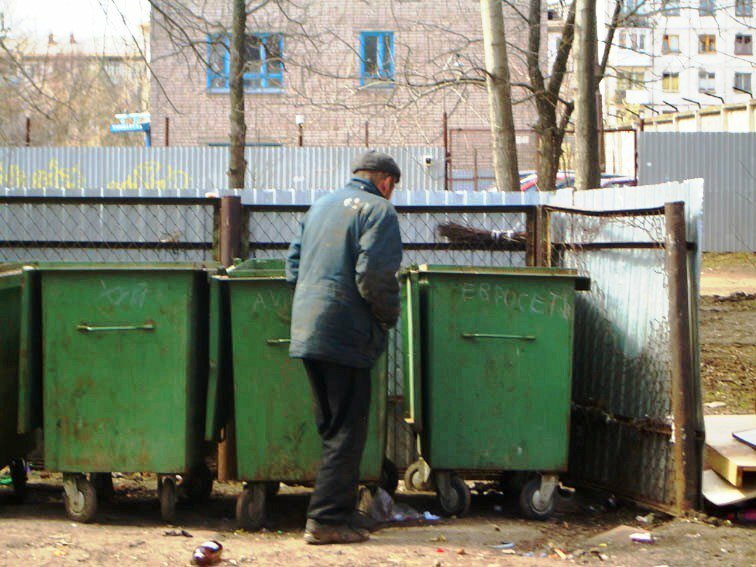 The homeless collect the bottles and once they've got enough, take it all to the deposit centres, where they get 30-50 roubles for their effort. This is their daily ‘wage', and they spend most of it on various spirit-containing surrogates, sold in the little shops under euphemistic names such as ‘body-massaging liquid' or ‘skincare product'. As for food, they eat whatever heaven sends. They don't live long, seldom making it beyond 40. The homeless are afraid of pet dogs, but often make friends with homeless dogs, feeding them on scraps from rubbish bins, and the dogs show them just as much love and loyalty as our pampered pet dogs show for us, their owners. Then I come to the bus terminal where the gardeners queue to get the bus out of town. The gardeners keep everything in order themselves. Quite a large share of Izhevsk's population owns a car, but among the allotment owners, there are far more who don't have their own ‘wheels' than who do. This is especially true of older people, whose cars have either long since gone to the graveyard, or whose health or finances simply don't allow them the luxury of a car. After all, you have to pay for a place in a garage cooperative, pay for repairs, petrol, MOT, car insurance. I count myself lucky I don't have one. The old people carry everything they need themselves, in their hands, in backpacks - things to eat, seeds, fertiliser. In the summer and autumn, they come the other way all loaded up, bringing their harvest into town. At least 70-80 percent of Izhevsk's population has an allotment, and some even have 2 or 3. People organise the little parcels of land into small non-profit cooperatives. There are hundreds of these co-operatives in the countryside around Izhevsk, mostly within 50km of the city. The local government gives veterans a 50-percent discount on the bus ticket out of town, but only within the 50-km zone. Further afield, the discount doesn't apply, and a one-way ticket costs more than 100 roubles these days. People in Izhevsk make a clear distinction between the concepts of ‘dacha' and ‘allotment'. There are dacha villages, but they are organised more like real villages. Dacha owners are generally the descendants of the old elite - the factory and party bosses, and the people who used to run commerce. Allotments are where the rank and file city dwellers toil away. Many are positively devoted to this labour, do it with delight and find something spiritual in it. Whatever the case, between March and October you can pick up a tremendous amount of useful information about varieties of carrots, how to fight weeds, winter salad recipes and so on from conversations overheard on public transport. This season, everyone seems to be redesigning their greenhouses. The past generation of greenhouses became notorious because they were made by setting glass into, or stretching film over, aluminium frames. The problem was that the aluminium was always disappearing - stolen to take to the non-ferrous metals deposit centres. The police gave up investigating cases of mass-scale aluminium theft from allotments. People's ingenuity, together with the latest advances in the chemical industry, gave birth to a simple and elegant new solution - a material called polycarbonate. This comes in large, flexible sheets that don't require any frame. You see these sheets, wrapped tight in rolls, leaving the city in an endless stream. It costs around 20,000-30,000 roubles to make a glasshouse of this type, rather a lot of money, yet everyone seems to be building them. Off goes another van with its load of polycarbonate, and I head the other way, into Izhevsk's town centre, where columns are forming for the holiday procession. It feels like stepping back into the 1980s with the same old trade union bosses running round organising their union members, getting everyone lined up, telling the brass bands to start playing. True, the design and the colours are different these days - mostly the white and blue of the United Russia party. The marchers aren't as numerous as in the old days. In the Soviet times, the marchers would start their way across the Central Square at 10 in the morning and the columns would keep coming through until midday. Nowadays, it's all over within 15-20 minutes. They march across the square and then break up immediately into groups of 12-15 people, open the vodka, unpack their sandwiches. Around midday, I saw one steelworker, weaving his way along, carrying three blue balloons for his grandsons. The official trade unions and United Russia's regional branch were not the only ones to get the people out on the streets under the slogan ‘Peace, Labour, May' on this holiday. Amongst the crowd, a group of young men in [Russian civil war era] ‘Budyonovka' hats caught my attention. One of them I recognise: Vadim, an emergency service doctor. I ask them to unroll the banner they'd made. It said that it was time the authorities took action to save the ambulance service. It's true that the emergency service doctors, mostly young men with families, earn only 7,000 roubles a month. With a family to support, this puts them below the poverty line. To make ends meet doctors have to take on extra night shifts and generally work overtime. My own taste of the municipal medical system before the holiday began convinced me once again that it is better not to get sick in Russia. I had a fever all week, and finally got taken to the municipal hospital. The duty doctor came out wearing a face-mask. I supposed he was taking precautions against catching some infection or other from patients. The ambulance service doctor had written in his accompanying report that I was ‘wheezing in one lung'. "You believe what some medical assistant says?" the hospital duty doctor said sceptically. "You don't have any wheezing". And he sent me home, with my temperature, on the tram. Three days later, an x-ray showed that my lungs really were infected. As for the doctor and his face-mask, he was quite simply drunk, and was wearing the mask to cover the smell of alcohol on his breath. But his speech, with all the hesitations so typical of drunkenness, gave him away. He's an educated man, this doctor, has a doctorate, but he probably also earns very little. Coming back to the holiday procession, the official columns marched by. At a safe distance some 300 metres away, over by the statue of Lenin (one of Izhevsk's only decent monuments, actually), the communists and various opposition groups were gathering their rather scarce ranks. The ‘and' does not mean that they were actually together. It's just that the regional branch of the Communist Party and the civic action coordinating council ended up in the same place. The rank and file mingled, of course, but their leaders did not. The civic action people accuse the local communists of ‘playing to the president's tune' and keeping their protests within strict limits. For their part, they regularly get 1,000-odd people in the streets under the slogans ‘Down with the president and government!' and ‘Put power under public control!' A dozen-odd young people from the Autonomous Action movement were out on this May holiday armed with these slogans. They kept their faces half-hidden, some with masks, some with scarves. ‘Anti-Fascism is not a crime!' they shouted. This is actually a real problem in Izhevsk. The anti-terrorism police units have taken many anti-fascist young people into custody, beaten them, tortured them, started criminal cases against them (in which the ‘witnesses' were neo-Nazis who'd in the past been given suspended sentences by the courts). One senior police officer called aside the Autonomous Action leader, Oleg S, and warned him that there were to be no ‘extremist slogans during the march'. Or else there would be arrests. The young people shouted ‘No to police arbitrariness', ‘Give us free education' and ‘The army is voluntary slavery'. There were no arrests. They all marched without incident. Sitting in the out-patient department in line for my x-ray, I started talking to an old woman of around 70. "Just so long as it doesn't rain", she sighed. "I still have to do the roof on my greenhouse". God answered her prayers. The sun shone in Izhevsk throughout the holiday period. People went out to toil away for their future harvest of fruit and vegetables. All that pickling and preserving is not just a hobby for many these days, but also a way to reduce the food bill during the winter months. The old women come out onto the streets to sell jars filled with their home pickles and preserves. I buy it all with pleasure - it tastes better than what you get in the shops. Editor's note: The city of Izhevsk, population 600,000+, lies west of the Urals. It is the capital of the Udmurt Republic, homeland of the ethnically Finno-Ugric Udmurt minority. An important centre of machine and arms manufacture, it was closed to foreigners in the Soviet period for this reason. Mikhail Kalashnikov, designer of the famous assault rifle AK-47 came from Izhevsk. Today, Izhevsk's giant Izhmash factory and its subsidiaries make Kalashnikov rifles, cars and motorcycles.